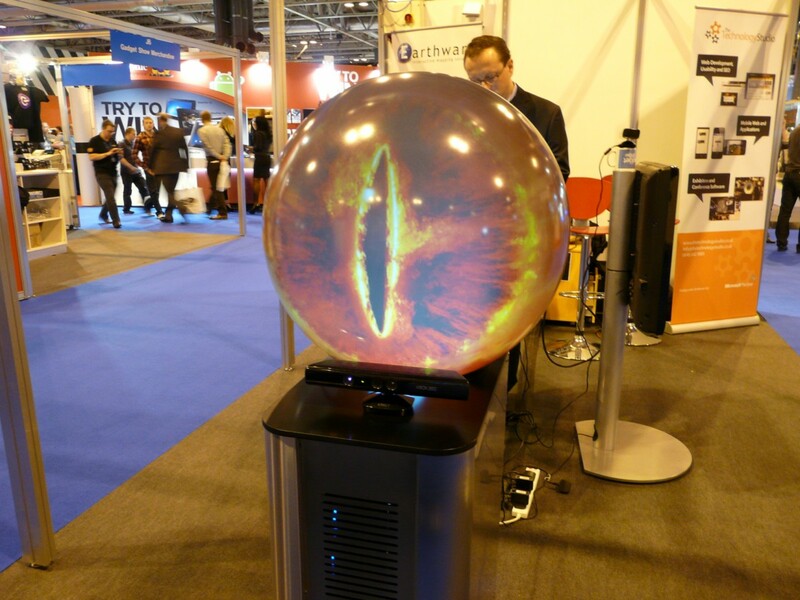 Whilst walking around the Gadget Show Live I was very excited, yet a little disturbed to notice the Eye of Sauron following my every move. I stopped to video the ‘eye’ which utilizes a Pufferfish Puffersphere orb and Microsoft Kinect to allow it to track a moving object, in this case people walking past the stand. Pufferfish, The Technology and Earthware have worked together on various other projects including the ‘eye’ which has attracted over 500,000 views on YouTube since the video went live in March. The core component is of course the Puffersphere, this version was 60 centimetres in diameter but the company supplies ‘hard ball’ full 360 video displays 90 centimetres in diameter. The open source software has been developed to work with the Xbox Kinect to perhaps provide the coolest, yet unnecessary use for a hack of this kind. People we have spoken to have suggested it could be used to ‘keep and eye’ on the office or children when out of the room, sure if you want to scare the pants off of them, go ahead. Neil from Earthware admitted that the ‘Eye’ is really just a party piece and not what the puffersphere was built for. It’s actually a high end advertising ‘orb’ used at tradeshows and events. Neil showed us another interesting use for the Puffersphere, a complete video of the earthquakes leading up until the fateful one that caused the Tsunami and beyond. Although watching the events on the sphere was a little eerie it does show the power this type of tech could bring to research and development and educational institutions. Imagine a truly interactive globe fed with live data that is touch-sensitive; apparently this is already in the pipeline and more. We can’t wait. Its important to recognize the importance of the Kinect. I think too many people are focused on 'look at these crap hacks' or 'why would I want to do that'. Lame. Focus on the bigger picture here people, the Kinect will change the way that we interact with computers forever. Sad to say that Microsoft was the one behind this movement, albeit by accident. With websites like, OpenKinect, Kinect Hacks, and now Microsofts Kinect SDK page its apparent that there's a serious movement around the Kinect. Ladies and gentlemen this isn't your 'lets hack PS3 and put Linux on it' type of crap. This is the forefront of NUI technology.